The Scarpa Arpia Womens is an excellent choice for those who want to progress to a high performace shoe without having to deal with the a shape which is too aggressive. The womens specific last has a lower volume than the mens version and features a slightly downturned profile and moderate asymmetry, this means that the Arpia has high comfort levels whilst providing a step up in terms of performance. It is a mid-stiffness shoe that gives enough support to your toes and maintains smearing ability and sensitivity. A zig zag style closure dubbed the Wave-Closure-System makes for great adjustability and quick on-offs. 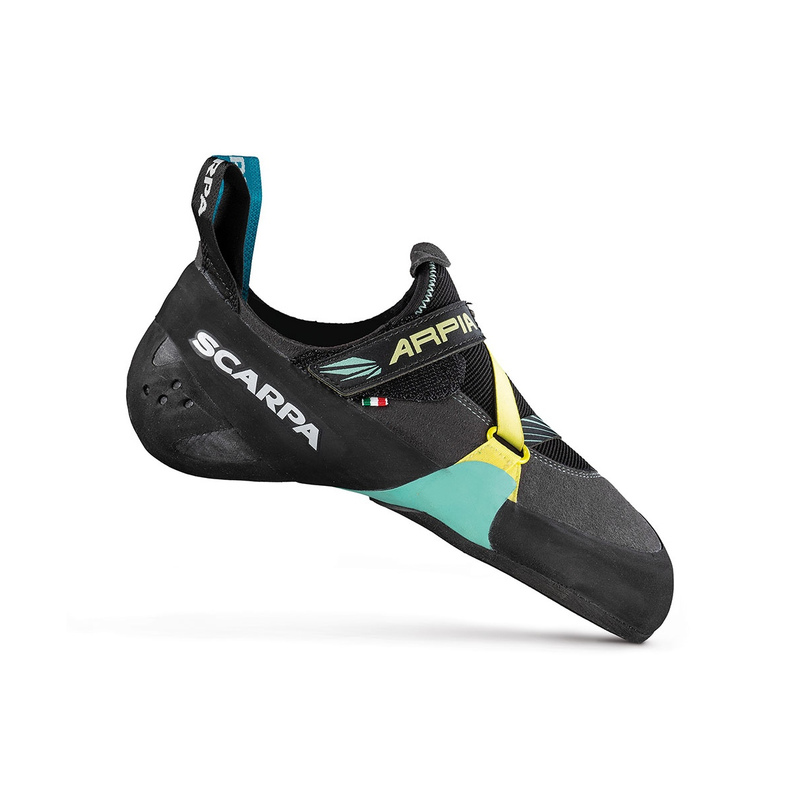 The Arpia Womens is not limited to any one discipline of climbing and should excel in any situation from multi-pitch trad routes to indoor bouldering. - The hand constructed heel construction adapts well to different foot shapes and is wrapped with Vibram® Grip2 rubber for maximum friction and sensitivity. - High comfort levels from an upper whose construction combines 3 panels in Microfiber and a bottom panel in suede. Integral lining for special comfort and durability. - V-Tension active randing system keeps the shape of the shoe over its life. It holds the forefoot in perfect position and supports the toe area for edging while it allows enough flex for smearing. - Full length Dynamic Flexan 1.4mm, with extension for heel reinforcement. Integral lining for special comfort and durability.